It is time for a fracked oil and gas moratorium on Ft. Berthold, and Standing Rock reservation, (where possibly up to 200,000 acres is being considered for fracking) needs to pass a ban, indefinitely. Hundreds of municipalities, counties, provinces and countries are. Indian country needs to do the same. North Dakota needs to as well. For me, this story began at Lake Superior, a place which is sacred to the Anishinaabeg and the source of a fifth of the world’s fresh water. I rode my horse with my family, my community, and our allies, from that place, Rice Lake Refuge to Rice Lake on my own reservation. Those two lakes are the mother lode of the worlds’ wild rice. Those two lakes and the region is threatened by a newly proposed pipeline of fracked oil from what is known as the Bakken Oil Fields of North Dakota, from the homeland of those Arikara people. The pipeline proposed is called the Sandpiper. We rode, but we did not stop. Driven to go to the source, we traveled to North Dakota. That is this story. Mandan, Hidatsa and Arikara territory is the sweet spot for Bakken crude oil, if that’s what we are to call it. About 20 percent of North Dakota’s oil production is coming from this reservation, in a state with l9,000 wells. Lynn Helms, ND director of mines, explains there are l93 drilling rigs in North Dakota, one-sixth of them, or 28, are on the Ft. Berthold reservation, 14 on trust lands and l4 on fee lands. There are l,250 active and producing wells on the reservation, with 2,l50 leased and ready to drill. Then, Helms explains, these wells will be in the “harvest phase of production,” soon. Everywhere, it is lit up as if the Eye of Sauron (from the Lord of the Rings trilogy) is present. That is what we see. What we also see is that there’s a huge change in wealth on the reservation. In fact, things have been going so well, that the tribal council, which five years ago was facing a $200 million debt, is now wealthy. The tribal chairman (who just lost a primary election), Tex, “Chief Red Tipped Arrow” Hall, is rumored to be a millionaire. The tribal council purchased a yacht, a l49 passenger yacht. That is a yacht to take Senators like Heidi Heitkamp and oil company executives out and about on the lake, which drowned their culture, and to enjoy the beauty and opulence many oil rich countries are accustomed to. The yacht sits quietly on a dock by the casino. No fanfare today. So let us talk about poverty and how North Dakota and the U.S. has treated the Mandan, Hidatsa and Arikara people historically. It may be that of all Native people in the region. They were the poorest for many years, an unspeakable poverty of loss … intergenerational trauma and the meanness of America … all manifest during the Indian wars and in the small pox epidemics, which wiped out 90 percent of their people. That was crowned, by the deepest of destruction -- the l954 Garrison Diversion project, which drowned a people under Lake Sakakawea taking l52,000 acres of their best land. The dams drowned their villages, drowned their agricultural wealth, drowned their history and rewrote it in America’s manual of agricultural progress. The sense of despair was, in some ways, manifest in the landmark Dana Deegan case, where Deegan abandoned and allowed to die, her newborn infant, an unspeakable horror. For this, she was sentenced to a decade in prison, in a highly controversial federal court decision. (Similar cases involving non-native women resulted in supervised probation and reduced sentences.) “The law needs to be changed and Indians need to be treated the same as their non-Indian neighbors,” Judge Myron Bright, dissenting Judge on the federal appeals court, said of the verdict. Bright pointed to the historic trauma and abuse in the Deegan case as the basis for his dissent (See http://www.freedana.com/). In the end, there is no grief that I can imagine is deeper. Except, perhaps the grief that is to come. That is unimaginable. And, that grief could be prevented by tribal leaders, or inherited by their children. Ft. Berthold is the tribal epicenter of hydraulic fracking. Despite industry claims, it is a big experiment -- made possible because of a perfect storm: an entire lack of federal, state or tribal regulation and unlimited access to water and air, into which everything is dumped. The 2005 Energy Policy Act had something in it called the Halliburton Amendment. That amendment exempted the oil and gas industry from most major environmental laws. This includes special exemptions from: CERCLA or the Superfund Act,Resource Conservation and Recovery (which manages hazardous waste), Safe Drinking Water Act, Clean Water Act (which maintains the chemical, physical and biological integrity of the nation's waters), National Environmental Policy Act and Clean Air Act. For the Clean Air Act, the exemptions involve emissions from any oil or gas exploration or production well (with its associated equipment) and emissions from any pipeline compressor or pump. The exemptions have worked out pretty well for industry, and one might argue for the short term leaseholder and royalties. Not so for those trying to protect the environment. Fort Berthold Reservation environmental director Edmund Baker has been a bit challenged in his regulation of the fracking industry. On July 8, what was known as the Crestwood spill was discovered. This means about a million gallons of radioactive and highly saline water was leaking from a pipe and headed to a stream and Lake Sakakawea. Industry officials, joined by Tribal Chairman Tex Hall, talked about how fortuitously all had been saved by three beaver dams. Let’s say “leave it to beaver” may be a bit of a simplistic environmental protection plan . The spill was found. Always a problem, because when something is found, it has usually gone on for quite a while. Baker’s job is already difficult, being as there are l,200 or so wells on the reservation and twice as many underway, not to mention a pretty substantial waste stream from the fracking industry. Those wastes are not just water or airborne, they are also radioactive. Let’s start with the problem of water. Fracking involves the use of immense amounts of water, hundreds of millions of gallons per well. One company (Southwest Energy Resources) told reporters that what’s involved in fracking is basic chemicals you could find in your house. That would be, it seems, if you were running a meth lab. Water used by fracking companies laced with over 600 toxins and carcinogens. Those chemicals are considered trade secrets and are not subjected to scrutiny. This has become a bit of a problem. Much of that water is being pumped into deep underground caverns by the trillions of gallons. In Colorado, there is one injection well that is over a trillion gallons. Injected. The data from North Dakota is hard to come by but it is emerging, but Colorado’s data has been probed by a host of concerned citizens. Shane Davis, directs a Colorado organization called Fractivist. He traveled with me. Colorado is a few years down the road in fracking. That is, there are 54,000 wells presently in Colorado, and in Weld County, where Shane lived, there were 22,000 wells, some 75 within a mile radius from his house. Shane got sick from the wells. At least, he described a set of serious rashes, going blind for a week, serious gastrointestinal problems, and a year and a half of a bloody nose. Then he got angry, “I conducted an investigative study using un-redacted, official COGCC spill/release reports and found that 43 percent of all oil and gas related spills resulted in ground water contamination with chemicals like benzene, toluene, xylene, ethyl-benzene and many more in Weld County, Colorado. There is twice as much flaring on the reservation as off the reservation. That’s to say that the lack of infrastructure has been surpassed by the speed of extraction. Natural gas burned in flaring is a byproduct of crude oil. Without enough pipelines to transport the gas at a state level, a third of what’s released each day, worth $1.4 million, goes up in smoke. Tribal members say as much as 70 percent of gas from wells on the reservation is flared. A Colorado School of Public Health study by Dr. Lisa McKenzie found airborne hydrocarbons near oil and gas facilities. Those include carcinogenic chemicals and endocrine disrupting chemicals being released one half mile away from the oil and gas facilities, at levels that would increase human cancer rates exponentially. Dr. Theo Colburn completed an air chemistry study that similarly found high levels of endocrine disrupting chemicals (EDCs) being released by the fracking industry. Those make you sterile, and a few other things. They are not to be trifled with. The gases include benzene, toluene, napthene, xylene and many more. Those are largely invisible to the eye. 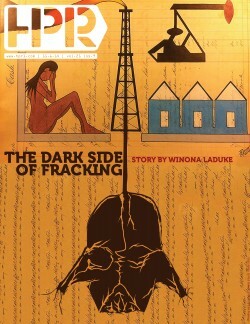 Davis continues, “A huge portion of the chemicals used in the fracking industry are protected as trademark secrets. This becomes important because if an active oil and gas well pad has an onsite issue, such as a blow out, or spraying chemicals in communities, or elsewhere, where there are animals or humans, the victims would not know the nature of the chemical contamination, and thus puts the patient and the doctor in jeopardy … the burden of expense has been shifted to the general public to pay for the emergency response ...” Stating the obvious, rural and tribal health facilities are not prepared. “The list of companies that are financially stressed is considerable,” said Benjamin Dell, managing partner of Kimmeridge Energy, a New York-based asset manager. That might be a bit of a problem when it’s time to pay up for the damages. Elsewhere, citizens in Colorado have enacted moratoriums on fracking in seven municipalities. New York and California are deep into battles over fracking. Nova Scotia has just banned fracking. Counties in England announced a ban in early September and there are a lot of questions being asked worldwide, and a lot of faucets catching on fire. Ft. Berthold needs a moratorium on new wells, and Standing Rock, the next reservation in line for possible fracking, needs a ban. It’s too risky, and our water is life.